Mexican designer Marco Antonio Barba Sánchez has won a James Dyson Award for inventing a low-cost seawater purifier, for castaways and people without access to drinking water. Bermuda has a pop-up design, with an inflatable water tank contained inside a triangular disc for easy storage. It is made for use in emergencies where drinking water is hard to come by but seawater, and the sunlight needed to distil it, is plentiful. In particular, Barba Sánchez had local fishermen in mind. "The design of this product began with trips in Mexico, where I noticed that fishermen do not have optimal equipment for fishing," said the designer. "Some of them have had several problems with their boats, the weather or even orientation and most of them didn't have the equipment to survive a longer shipwreck." Barba Sánchez worked with doctors and other professionals as he researched the current water purification options available to the fishermen, and whether they could be bettered. "I found several processes that can be improved and that work but aren't so efficient," he continued. "That is why I decided to combine some of these techniques and basic principles of physics and chemistry to achieve a much more efficient process." Bermuda combines a few techniques for purifying water – solar distillation for the primary process of separating water from salt, and filtration to remove any bacteria, algae or sediment. Both processes are done in the inflatable tank, which Barba Sánchez has designed with features to make the water distil faster. The air pressure between the outer and inner layers of the tank can be manually controlled, generating a vacuum and lowering the boiling point for the seawater. This also allows the saturation vapour pressure to be adjusted in the next stage of the process, so the steam can be captured and condensed back into water more quickly. The designer estimates that one Bermuda unit could produce between 2.1 and 4.2 litres of drinking water per day, depending on the amount of sunlight. It's safe to drink only in emergency situations and not for a prolonged period of time. In the current prototype, the inflatable water tank and the triangular orange lid, which contains the filling cap and air pressure valve, are two separate parts. Barba Sánchez says that industrial production processes would allow Bermuda to be constructed as a single piece that expands out. 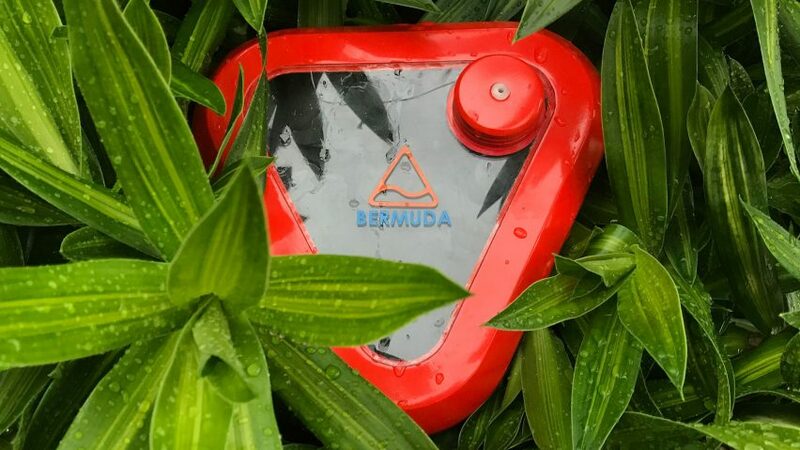 Bermuda was the national winner for Mexico in the James Dyson Award, which recognises top inventions from current and recent engineering and design graduates from around the world. Barba Sánchez graduated from the Industrial Design programme at Anáhuac Mayab University in Mérida, on the Yucatán Peninsula, in 2016. British inventor James Dyson – famous for his vacuum cleaners – will pick the grand prize winner of the international competition on 15 November. Previous years' winning inventions have included a skin cancer detector that avoids the need for biopsies and a folding paper bicycle helmet.